Home / Phcog J, Vol 8, Issue 4, Jul-Aug, 2016 / Phytopharmacological overview of Psidium guajava Linn. 1Department of Human Genetics and Molecular Biology, Bharatiar University, Coimbatore-641 046, Tamil Nadu, INDIA. 2Department of Biochemistry, M.I.E.T. Arts and Science College,Tiruchirappalli-620 007, Tamil Nadu, INDIA. 3Department of Chemistry and Biosciences, SASTRA University, Kumbakonam-612 001, Tamil Nadu, INDIA. 4Department of Microbiology, Cauvery College for Women, Tiruchirappalli-620 018,Tamil Nadu, INDIA. Psidium guajava Linn. possesses useful medicinal benefits. It has been recognized as the medicinally essential phytoconstituents, such as phenolic, flavonoid and carotenoid. Numerous pharmacological investigation have confirmed that the ability of this plant is to exhibit antimicrobial, antidiabetic, cardioprotective, neuroprotective, hepatoprotective, antioxidant and anticancer activities and it supports the traditional uses. This is a comprehensive of the phytoconstituents and pharmacological benefits. ‹ Review of the phytochemical and pharmacological activities of Euphorbia hirta Linn. 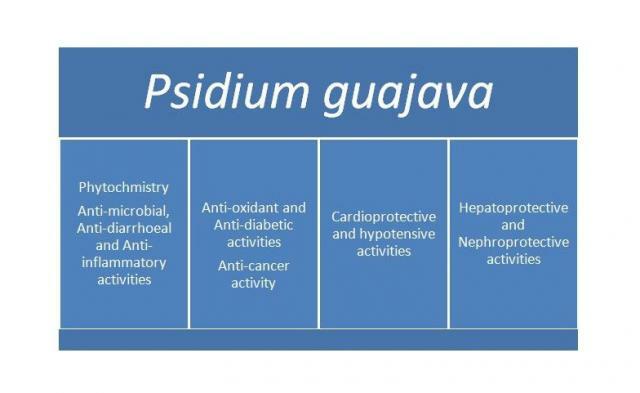 Anand V,, Kumar V, Kumar S,, Hedina A. Phytopharmacological overview of Psidium guajava Linn. Pharmacognosy Journal. 2016;8(4):314-320.